At the end of the evening introduction to sacred Diné ways, Thomas Hatathli talked briefly about the Blessingway Ceremony he would offer the next day. He spoke of it as a cleansing, a restoration to full health, life-affirming choices and connection to all beings. Through song and prayer the ritual would provide a channel for healing. I waited until he was free, then talked to Thomas privately. “I asked that question for myself. I’ve just returned from Peru. I was in a Q’ero village where I have relationships and learned of a death. I think I’m carrying a lot of grief.” I told him only that. During time in the village in my role of group leader, I wasn’t able to really process the tragic story I’d been told of a young mother’s sudden, recent death and the devastating effect I witnessed on the dad and very young ones she left behind. Ever since, images had continually played in my mind of the event I never saw—haunting me. I couldn’t shake them, and I was experiencing a physical impact that was getting worse. I wasn’t expecting this explicit invitation. I nodded yes. “Then sit beside me tomorrow.” He asked no questions, nothing causing me to replay the painful moments. The next day we gathered again at North Mountain Visitor Center, which backs up to the Phoenix Mountain Preserve. I found Thomas outside at the small amphitheater that opened to the land, already preparing himself. He said this round place was a good one. At home he holds ceremonies in a hogan. As he’d asked, I sat next to him. Others assembled in a loose circle. He took a small rug and woven cloth from a bag and laid both on the ground in front of him, one on top of the other. As he readied the space, he spoke about the turning basket he placed in the middle, the significance of the circle around its perimeter. There was a break in the circle where anything that was not life-affirming could be released to the east. He noted that some patients were afraid to let go and needed encouragement. He’d made sure to place the turning basket with its break to the east, the same as a hogan’s doorway. Example of a turning basket. Thomas inherited this turning basket from his grandfather who was a medicine man. It had to be over a hundred years old. I could only imagine how many ceremonies it had seen and the power it held. Even as the formal ceremony had yet to begin, I felt its energy reaching for us. We all were invited to place items—sacred bundles, jewelry, stones—in the turning basket; the purpose to represent each of us in this ritual, to clear any traumas or aspect out of balance. Thomas talked about the sequence of ancient songs he would sing, the meaning of each one. The Mountain Song would come first, calling in the benevolent spirits of sacred mountains to provide protection and healing. Next would come the song he sang for himself, asking for the strength and capabilities required to sing the songs and make the prayers. The Bluebird Song was one to bring in happiness. The Returning Home Song was about returning home, to the natural order, coming home to your true Self. The prayers would come next, twelve of them. When Thomas began to sing I closed my eyes. Before long I was lost to this world and entered the landscape this Chanter was weaving. Somewhere in there a thought swam up. I’ve heard this before. It sounds so familiar. I grasped to make the connection but couldn’t and surrendered again, letting the songs take me. At points periodically I experienced a lifting sensation as though leaving my body and thought it would fall over backwards. Somehow I remained upright. Every now and then my ears popped. As the last song ended, I opened my eyes and knew how the songs were known to me. Icaros. Just a few weeks before I’d been with Don Alberto Manqueriapa, a respected Huachipaeri-Matsigenga spiritual leader, again in Peru as he sang the icaros during the rainforest rituals that hold the same intent of the Blessingway Ceremony. A return to the natural order. They couldn’t be the same language. Yet they were. And they held the same frequencies. They were drawn from the same place. Thomas handed me the feathered female medicine stick to hold in my left hand and a small deerskin bundle that held dirt from the Sacred Mountain for my right hand. As I received them extraordinary energy washed over me and I knew their power, recognized how many people had held them as I was now. The Blessingway prayers began, a continual chant until complete. He directed me to press the medicine stick and bundle up and down both legs, then the rest of my body. Pressing them to my face would cleanse the senses and perception. To my head, purified the mind. Thomas went to the fire made earlier and threw herbs upon the flames, a further prayer for happiness and blessings. We all went up and made an offering of corn meal. The Blessingway Ceremony came to a close. I remained seated outside for some time while others drifted back inside where we would share a meal. I didn’t trust my ability to walk. I wasn’t yet fully back in the material world. And I was assessing my state. I felt different, as though something had lifted. I was much lighter. Three hours had passed as though mere minutes. We’d been encapsulated in a timeless bubble as the world around us went on. A short distance away people were on the preserve’s hiking trails. The parking lot had been full. I’d heard nothing but the cadence of Thomas’ words moving on the air. I felt nothing but the energy coursing through my body, taking me somewhere, and only a slight warmth from the sun. Not its increasing strength as it followed its path across the sky. Naomi Tsosie had stayed behind, too. During the ceremony, she and a few other Diné women who were present sang softly, barely a beat behind Thomas. I later learned that these echoes are sustenance to the Chanter providing strength for them to continue, sometimes many hours or even days depending on the need. Naomi came over to me. She gave me a sacred gift that I will always treasure. I understand the meaning. I only wish I hadn’t been so altered and could have expressed adequately how her action and kind words truly touched my heart. Thomas knows over 500 hundred songs. He retains them in his mind, passed to him orally, not to be written down. Each having their own purpose to be drawn upon depending on the needs of the patient. That day we experienced an abbreviated version of the Blessingway Ceremony by necessity of the circumstances. I truly get how this is a way of healing. It has had a lasting effect on my state of being, emotionally and physically. Thomas’ level of impeccability—the care in which he spoke his words, the seamless way I absorbed their deeper meaning, how I felt the medicine he delivered—is a rarity. He would never say so himself…but I believe we were in the presence of a true Holy Man. This is Part Two of a two-part article. To read Part One, go here. To learn more on the Blessingway Ceremony, go here. I wish to acknowledge Ruth Harrison, Kimberly Ewing, Nathan Shannon and Norm Meier who were present and contributed their memories of our time with Thomas, filling in where my own memory gapped. In the old days there existed 200 or more traditional Diné healers. * “Now,” Thomas Hatathli told us, “There are only 30 to 40.” As I listened to Thomas’ words my heart felt a tug of sadness to be hearing again what I’ve heard so often—directly from the Indigenous healers themselves. And I imagined what it’s like to be one of a dwindling few, and perhaps the only one left in some cases, who dedicate their lives to the wholeness of their people and the planet, living the ancient principles every day. We’re honored that Thomas accepted our invitation to share some of the work he does as a traditional healer of his people. ** Tall and spare, Thomas radiates a quiet strength. He began with a prayer. Then he introduced himself by citing his clan relations, adding, “This is who I am. I know I’m never alone.” And I got the true understanding that knowing your origins, stretching back centuries, gives of itself to spiritual grounding. For the next four years, Thomas dogged the heels of his cousin, already a medicine man, learning the songs, prayers and rituals, the teachings of his ancestors. Until finally, he was ordained as a healer and Blessingway Chanter. That was more than 25 years ago. He retains little time as his own. Weekdays he works as a mental health specialist at the Tuba City Regional Health Care Center. And nearly every day people come looking for him, asking him to sing the songs and release the prayers that bring healing. Thomas freely gives of himself to do so. Nights and weekends are not his but theirs. To maintain balance, he runs. Thomas has run 16 Boston Marathons—soon his 58th marathon total. He shows no signs of slowing down. That evening he dispensed pragmatic wisdom in an unassuming way, just stated fact. And even though I’d heard what he said before, presented in any number of ways, his way slipped in to find a home. Much of what he offered was about gratitude and presence, making good choices—the underpinnings of a healthy life in all ways. When I chew my food I taste it. I enjoy it. I break the food down to give my stomach a break. In this way I conserve my energy for when it’s needed. The body needs movement to be healthy. People say they don’t have time. Go forward but reach back. When I pray it’s a thousand years of wisdom coming through my mouth. His practical spirituality is comforting. And it’s evident his life is one of alignment to core values, to family and community. Yet it’s also true his life is one of great sacrifice—one he chooses. Nothing good comes easy. We need to appreciate effort. True medicine men don’t choose that path. It chooses them. It means relinquishing an everyday life and surrendering to sacrifice, one that ultimately works at a global level. This is Part One of a two-part article. Part Two is on the Blessingway Ceremony in which I was the patient seeking to return to the natural order offered through these songs, prayers and rituals. Read Part Two. I wish to express gratitude to the Native people who attended this offering and showed respect to this Elder: Naomi Tsosie, Lucilia Benally, De Alva Ward, Ron Interpreter and Sam Hogue. I also acknowledge Ruth Harrison, Kimberly Ewing, Nathan Shannon and Norm Meier who were present and contributed their memories of our time with Thomas, filling in where my own memory gapped. **Twice a year Kenosis Spirit Keepers sponsors an educational outreach program for the general public in which participants can learn and experience the teachings of Indigenous peoples from spiritual leaders and healers who serve their community. We call it the Spirit Keepers Series. ***To gain an understanding of the devastation wrought from The Long Walk in the 1860s, the 1974 Navajo-Hopi Land Settlement Act, the forced boarding schools and acts in-between, the residual trauma which extends all the way to present time for Diné and Hopi alike, read A Historical Overview of the Navajo Relocation published by Cultural Survival. 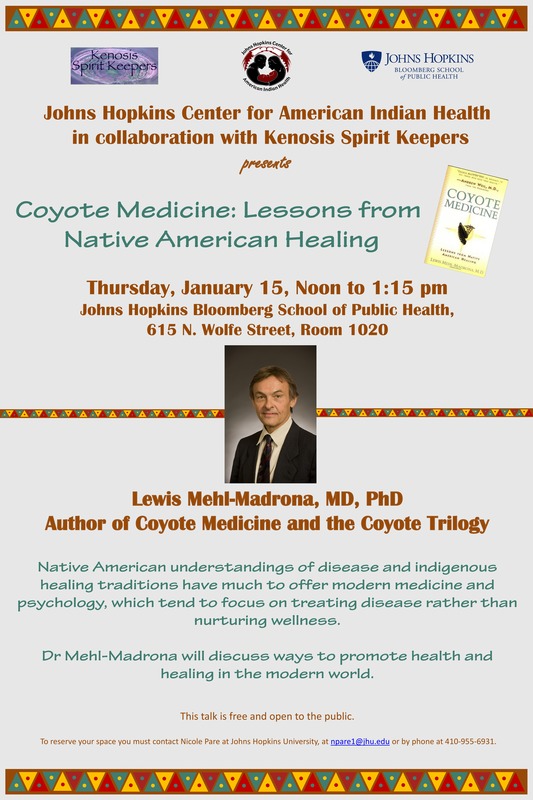 In January 2015 Kenosis Spirit Keepers was pleased to collaborate with Johns Hopkins Center for American Indian Health to bring Lewis Mehl-Madrona, MD, PhD, to Baltimore to speak on Coyote Medicine: Lessons in Native American Healing. Dr. Mehl-Madrona, Lakota-Cherokee author of the Coyote Trilogy, shared about historical trauma, lessons about community healing and resilience that come from Native communities. 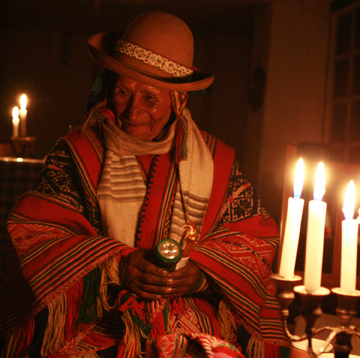 Seti Gershberg has produced an important documentary containing key elements for Westerners to fathom the mysticism of the Peruvian Andes: the descendants of the Inka who embody it, their history and traditions. The film is rich with interviews of Q’ero mystics and breathtaking vistas that perfectly enveloped this viewer, taking me back to all the times I sat in circle with these beautiful people. The energy they carry came through the screen. We are offered teachings from the Q’ero worldview about interconnection, the inherent birthright of prosperity for all—not just a few—and how ayni, or sacred reciprocity, creates flow and balance. The Q’ero people are living examples, incarnating the natural laws that we all must embrace for global transformation. Segments show despacho ceremonies offering gratitude to the Pachamama (Mother Earth) and Apus (mountain spirits), and blessing prayers. How lightning is a message from the Apus signaling an individual’s role and healing methods are disclosed. Paq’os (shamans) outline initiations and practices for the life of a healer and mystic—how the process happens over years of commitment, often with strong challenges. One young paq’o describes how, in earlier years, he helped gather materials for the despacho. Then at fourteen he assisted in the making, but it wasn’t until he was eighteen that he was deemed ready to do them on his own. I was personally glad to see this distinction included. Hopefully, it conveys to a Western audience that such a path does not happen in a weekend workshop; nor is it a romantic undertaking but one of humility and sacrifice to community. Juan Núñez del Prado, Joan Parisi Wilcox, Elizabeth Jenkins, Holly Wissler and J.E. Williams share their understanding from an outside perspective as scholars and authors but also as practitioners of Andean Cosmovision. We will not forget or lose this knowledge. Q’ero Mystics of Peru came at an opportune time, just as I’m preparing to return to Peru to be with Q’ero friends in the village of Ccochamocco for an unprecedented occurrence during The Heart of the Andes. Hopi Elder Harold Joseph from Shungopavi, Second Mesa, Arizona, is accompanying us, as an emissary of his religious leader, to seek prayers for the preservation of Hopi traditions. He says: The Q’ero spiritual leaders are strong in their prayers. So they are. I personally thank Seti Gershberg for documenting the wisdom of the Q’ero Nation so effectively. View the trailer. Film length 1 hour, 6 minutes. Purchase and view or download through The Path of the Sun. I write this to honor him. He touched a multitude of people, both literally and figuratively, in his 90-plus years. For sure, all the people who traveled with me in Peru will not have forgotten him. Memories of him are carried within us. 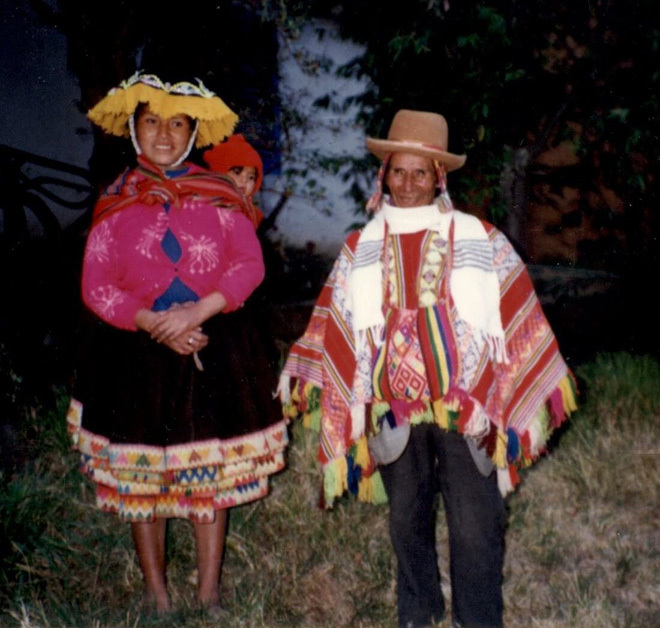 Doña Maria and Don Miguelito, 1996. Looking back I realize the many things I learned from him over the years. I never knew the kind of things that are common if we’ve known someone long: his last name, if he’d had a wife or children, if he was born in the village of Mollamarka above where he’d lived. He was a solitary fixture, sometimes appearing in front of his small adobe, hand in his coca bag, when visitors arrived at Salk’awasi. Watching. But I did know that witches from the small village on the next mountain made their way over to consult with him periodically. We called him Miguelito, an affectionate diminutive, which did not at all express the power he held. Although, it did note his small physical stature. I’d be surprised if he’d brushed 58 inches. He did not demand recognition as some do. He was not flamboyant. He spoke few words. Yet, if you paid attention, you’d be aware of the teachings he conveyed. neat. In his last years, he tended them less. The land suffered his absence, going back to nature—perhaps symbolizing Miguelito’s own symbiotic journey. Nevertheless, he touched the Pachamama, Mother Earth, and created sacred containers, leaving his imprint on the land that will never dissipate. Miguelito had been struck by lightning himself—twice—a known shamanic initiation in many indigenous traditions. He ran his lightning stones over our bodies removing hucha, or heavy energy. His coca readings were spot on, seeing things in us that we needed to attend to in order to further the journey and foretold futures perhaps not even a blip on our own radar yet. The coca leaves told him so. My own first experience with Miguelito is forever emblazoned in my mind. I was a real newbie, not really knowing which end was up, feeling my way on an invisible-to-me path. I wrote about it in my first book Calling Our Spirits Home. A bit is excerpted here. Miguelito was bent trance-like over the leaves, sifting them with his gnarly fingers, muttering under his breath…he picked up a few coca leaves and began chewing them…he spit them out on the table. Moving his hands…he seemed to be noting where the pieces fell…he began to speak…Stopping, he turned and looked me directly in the eyes as though searching for something…Miguelito’s words [translated from Quechua] seemed quite unlikely to me. ‘That storm we had the other night?’ I nodded. How could I not recall it? I had started awake in the middle of the night…Lightning lit up the room from its savage dance across the mountaintops right outside my window…’The lightning was for you and its filaments are inside you now. I’m surprised that it was for you.’ No more surprised than I was, unclear of his meaning…Abruptly, he got up from his chair, came over to me and started rooting through the hair on top of my head with his fingers. ‘Ah, there’s where it went in.’ Seeming now satisfied with his finding he sat back down. He went on to tell me of the work I would begin to do, a large part of it bringing groups to Peru with spiritual intent. That was in 1996. Indeed, the reading held true and has evolved from there to include other Indigenous traditions and countries. The last reading I had with Miguelito was in 2011 when he told me that my work would continue to be difficult. This was not something I wanted to hear but recognized what is typically so when anyone is going against the grain of the status quo and mainstream culture. My intent is in holding the challenges lightly. Miguelito was not afraid of being blunt. In fact, he used no filters in advising what was causing obstructions. Sometimes I saw people wince. It was always interesting to me in that the same issues would come up for the person to deal with during our travels. He also instituted healings. I wrote of one in the recent post Collective Resonance and Healing how the jungle absorbed a woman’s chronic condition. He was often out in the dead of night. Perhaps he was communing with the mountains, stars and planets, perhaps spirits that best showed themselves in the wee hours. Now he may show himself in just that way. *Paq’o is the word for shaman in Quechua. 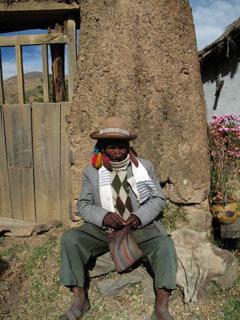 Salk’awasi is the ancestral home of Peruvian mystic Don Américo Yábar. Salk’a means undomesticated energy. Wasi is place or house. **Mesa is the Spanish word used for medicine bundle. ***Limpia is the Spanish word used for rituals working with clearing energy in and around the body.